OBOCK, Djibouti, Sep 6 2016 (IPS) - Tears emerge from the slit of 20-year-old Gada’s black niqab face veil. After more than a minute’s silence she still can’t answer the question: How bad was it in Yemen before you left? During 2015, escalation of fighting in Yemen led to a mass exodus. 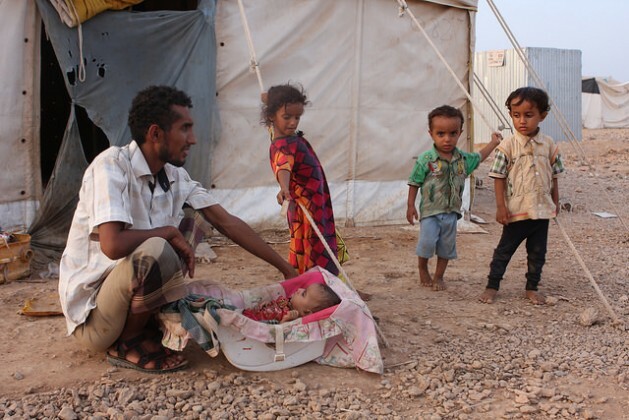 The UN refugee agency estimates that more than 2.4 million Yemenis have fled their homes to elsewhere in the country, and 120,000 have sought asylum in other countries. “My future used to be in Yemen when I had a father with an income. But if we go back we’ll be starting from scratch. Before, we depended on ourselves, but how do we do that now?” -- Issa, an 18-year-old refugee in the camp in Obock. This includes Somalia and Djibouti on the opposite side from Yemen of the 30-km stretch of water known as Bab-el-Mandeb, meaning the Gateway of Tears—a name derived from the long history of people perishing when trying to cross it—at the southern entrance to the Red Sea. “Education is obviously important, and the school gives parents a much needed break from their kids in the cramped camp, but this is more to do with showing the refugees that they matter and have a future—that they’re not left out,” says Marianne Vecchione, a Los Angeles resident who has spent the past year in Obock. 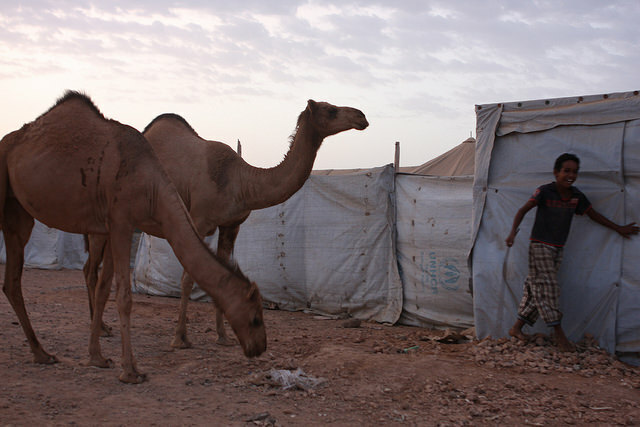 After one typically sweltering day in the camp—daily temperatures regularly exceed 100 degrees Fahrenheit—as the sun sets Yemeni children giggle among themselves as they hesitantly approach and pet a group of camels, idling in a sandy lane running between groups of tents. The sight of the camels provides a rare moment of excitement amid the drudgery of camp life. 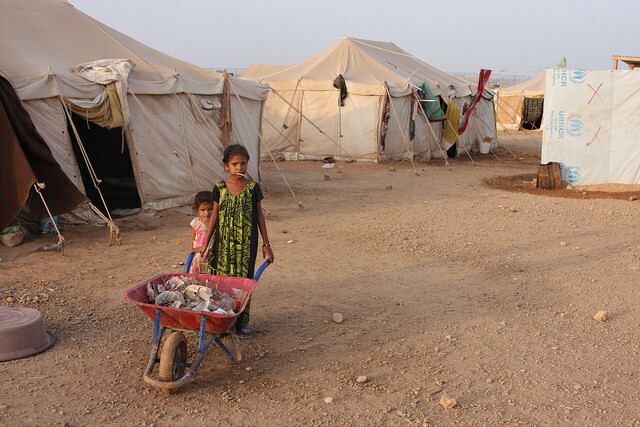 Housed in the simple tents are Yemeni from all over the country and from all walks of life: from poor fisherman to relatively affluent professionals of the middle class. Despite such deprivations, refugees try to keep a sense of humour about their predicaments. In August, UN-sponsored talks in Kuwait for establishing peace in Yemen ended after 90 days unresolved, with fighting resuming between government forces and rebels. Yemen has fallen foul of a proxy war being waged between Saudi Arabia, supporting Yemen’s government forces, and Iran, backing the Houthi rebels who, according to Yemeni in the camp, having committed the most and worst atrocities. Djibouti’s government is often criticiz]sed for not doing enough to help large numbers of unemployed and impoverished in the country. But Vecchione notes how its Ministry of Education helped and cooperated fully with her when she undertook to take two groups of students to Djibouti City to complete exams, enabling them to progress to high-school and university in the future. The influx of Yemeni refugees into Djibouti has totalled about 35,000, Kelly says, adding how, relative to the size of Djibouti’s population, this is like 13 million people entering the U.S. Despite the refugees’ dire situation, Vecchione encountered opposition to her endeavours to help. She was accused by some of trying to convert students to Christianity—even though the school taught the Yemeni curriculum including lessons on the Koran and Islam. It’s clear that some refugees appreciate what one Christian volunteer has done for them, despite what can be vast cultural and religious differences. Meanwhile, although the ongoing war in Yemen can easily appear impossibly intractable, and its terrible fallout insurmountable, Vecchione notes how often the smallest things can still make a big difference.